In a blender puree raspberries and orange juice. In a bowl whip heavy cream and sugar until soft peaks form. Fold in yogurt and half of the raspberry puree. Snip the top edge of the Dixie cups with scissors for easy peeling. Fill Dixie cups 1/4 of the way with the whipped mixture. Add about a teaspoon of the raspberry puree and spread evenly using your finger over the top of the whipped mixture. Fill the cup with remaining whipped puree. 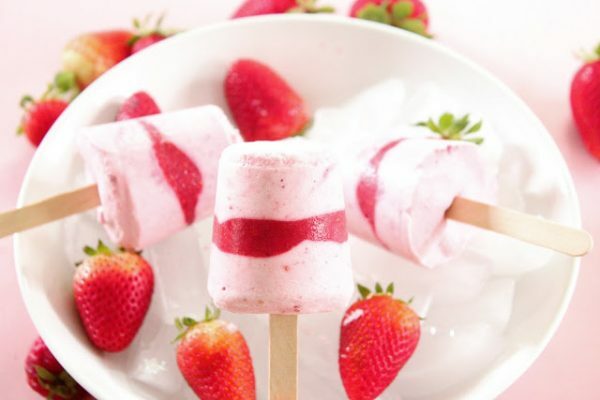 Place a pop stick in the middle of each popsicle and freeze 4-5 hours before serving.